Avery Binder Spine Insert - 1"
Customize binder spines with professional-looking spine inserts. Microperforated cardstock allows for easy separation of each spine. Firm cardstock makes it easier to insert each spine into a binder. 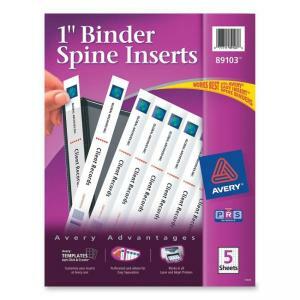 Works best with Avery Binders featuring Avery Easy Insert spines. Laser and inkjet compatible. Easy to format using blank and predesigned Avery Templates.